This sticky orange cake is a pure joy: moist and buttery on the inside with a sticky coating of bitter sweet marmalade and a good dash of whisky. Best use a sweet, honey-tasting whisky for this cake, as a smoky spirit might be too overpowering. You can of course do without the alcohol, in which case it’s best to melt the marmalade with 4 tablespoons of water. Preheat the oven to 180° C fan. Peel two oranges and cut into thin slices. Squeeze the juice of the remaining two oranges into a small bowl and set aside. In a bowl, mix the sugar, vanilla sugar and butter until pale and fluffy, then beat in 3 tablespoons of the marmalade followed by the eggs. Fold in the flour, baking powder, almonds, salt and orange juice. Put a 23 centimeter round springform onto a piece of baking paper, and draw a circle around the bottom. Cut out the circle of baking paper and put it in the bottom of the tin. Grease the sides of the tin with some butter or oil. Sprinkle the brown sugar onto the baking paper at the bottom of the tin. Arrange the orange slices on the base of the tin in a slightly overlapping layer. Carefully pour the cake batter into the tin and bake the cake for 65 minutes. You can check if the cake is done by pricking a wooden skewer into the middle of the cake, when it comes out clean, the cake is done. Take the cake out of the oven and let it rest for 5 minutes. Then, cut around the edges and remove the spring form ring. Very carefully, while the cake is still warm, put a serving plate on top of the cake and turn it over, so that the bottom is now at the top. 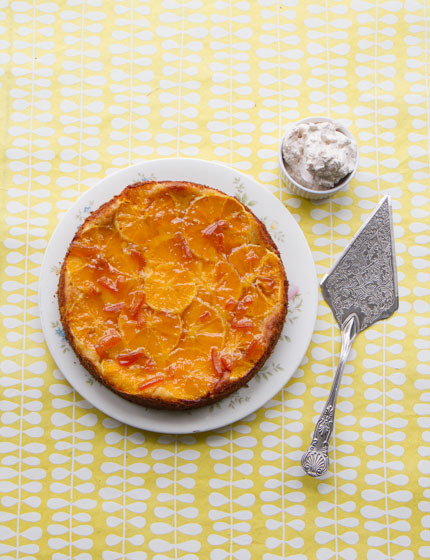 Remove the tin and baking paper to reveal the oranges on top of the cake. In a saucepan, heat the remaining 3 tablespoons of marmalade with 4 tablespoons of whisky until it becomes liquid. Prick holes in the cake with a skewer and spoon the marmalade whisky liquid over the warm cake. Let the cake completely cool down before serving. Meanwhile, make the whipped cream by beating the cream, sugar and cinnamon with an electric whisk until it forms stiff peaks. Fold in the whisky with a spoon and serve with the cake. Kann ech w.e.g. d’Rezept vun ärem schéinen Orangekuch kréien. merci fir ären Comment. 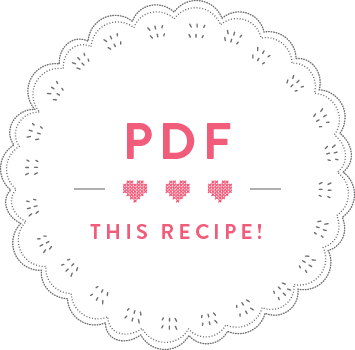 D’Rezept vum Orangekuch hei op deser Säit ze fannen 🙂 Wann dir op den Naperon “PDF this recipe” dreckt, dann kennt dir d’Rezept downloaden. An wann dir rof-scollt steht d’Rezept och nach eng Keier als Text do. Made this for a belated father’s day tea (whisky and marmalade are two of his favourite things) and he loved it. Moist tasty cake, great, clear instructions. Thank you.